First, lets define the difference between an MPU and a CPU. Back when a computer filled an entire room and was built on a main frame, the part of the computer that did the actual processing was called the Central Processing Unit (CPU). Eventually the CPU was shrunk down to a printed circuit board, referred to as the Mother Board. The part of the computer that does the actual processing was integrated into a single integrated circuit (IC) called the Microprocessor. A microprocessor (sometimes called MPU for microprocessor unit) is an IC that contains only a central processing unit (CPU). A microprocessor generally does not contain I/O (input/output) circuitry or memory (RAM, ROM). An example of a microprocessor is Intel’s Pentium. However a modern microprocessor IC usually does contain some cache memory (integrated memory to speed up main memory and storage device access) and I/O such as integrated audio and video circuitry. A microprocessor would generally be used in a general-purpose system such as a desktop PC, laptops, notepads etc. A device that has an operating system that can load a variety of different software applications from storage media. A microcontroller (sometimes called MPU for microcontroller unit) is an IC that contains a microprocessor as well as certain amount of RAM, ROM and general I/O ports. Engineers design microcontrollers into specific-purpose devices such as microwave ovens, cars, washing machines, refridgerators, and even space probes. Such a device is often referred to as an embedded system. A microcontroller can be programmed before being soldered to a PCB (printed circuit board), or the PCB have a port through which the microcontroller can be programmed. 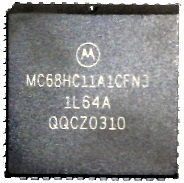 There's no reason why a microprocessor along with some external memory and I/O circuitry couldn't be used as a general-pupose microcontroller, and the Motorola 68000 microprocessor was often used for that. There's no reason why a microcontroller couldn't be used to make a general purpose device such as a personal computer. And the Broadcom BCM2835 (which they prefer to call System-on-a-chip (SoC) rather than a microcontroller) is used for that in the Raspberry Pi. One of the most popular families of microcontrollers is Microchip's PICs. PIC devices range from 8-pin DIP chips up to 100-pin SMD chips, with discrete I/O pins, ADC and DAC modules, and communications ports such as UART, I2C, CAN, and even USB. The PIC10F200 is a low-cost, high-performance, 8-bit, Flash-based CMOS microcontroller. It employs a RISC architecture with only 33 single-word / single-cycle instructions. All instructions are single cycle (1 µs) except for program branches, which take two cycles. The easy-to-use and easy to remember instruction set reduces development time significantly.